We are creating interactive tools that help adolescents with a chronic illness transition successfully to independence in managing their own health conditions. Additionally, we are redesigning clinical systems and tools to help staff and providers coordinate the transition of care from pediatric to adult specialty clinics. The journey from pediatric to adult specialty healthcare can be an uncertain, stressful, and complicated transition for adolescent patients with a chronic illness and their families. Through ethnographic research interviews and observations with dozens of participants (patients, family members, providers and other clinical staff) we learned about several factors that help young people be successful as they prepare for and transition to adult healthcare. Providers told us about the many skills that young adults need to build around self-advocacy and self-care — skills like understanding their medical condition and medications, and knowing how and when to contact their doctor. Patient and families shared about their strong bonds with their pediatricians, and the fear they feel when thinking about switching to a new adult specialist. We heard about the importance of hands-on education from providers and opportunities for young people to connect and learn from each other along the journey. 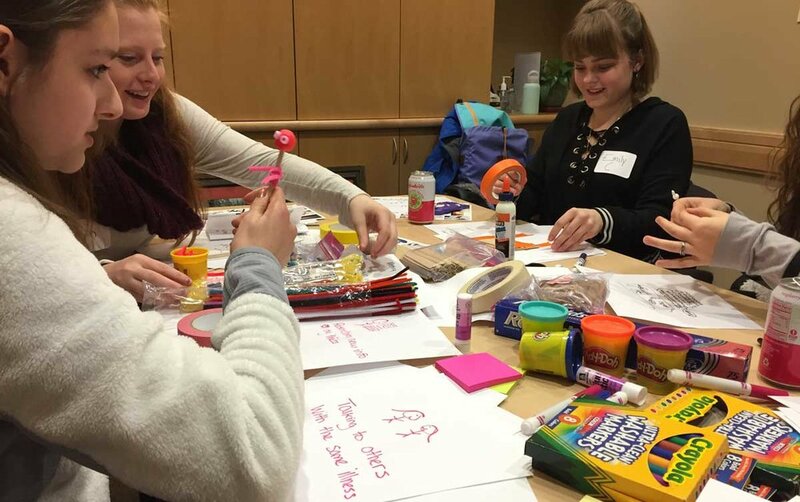 In order to engage our adolescent patients more meaningfully, we invited them to participate in co-creative workshops where they shared stories about their transition of care journeys, and then brainstormed and created their own ideas. With this input and other research findings, we created two prototypes to test out with patients: a text messaging chatbot, and a peer-to-peer workshop. The goal of the text messages and the transition workshop is to help patients meet key milestones along their journey that will help them prepare for becoming more independent in managing their chronic medical conditions. We recently conducted an IRB-approved research study of the transition of care patient workshop and text messaging chatbot. It included 13 teens from Pediatric IBD, Cardiology, and Diabetes, ranging in age from 14-17 years old, along with their parents and providers. Our evaluation methodology included: 1) surveys administered to patients, their caregivers, and providers throughout the 6 month period to measure the efficacy of the workshop and text messages; and 2) data analytics of the text messaging program. The pilot we developed yielded promising results, and we identified ways in which we can expand and improve it. We learned that our adolescent patient participants overwhelmingly agreed that text messaging was the appropriate communication channel for them; their engagement with the text messages was consistently high (just over 96%) throughout the pilot. In many topics concerning “hard” skills (e.g. ordering medication refills), patients (and caregivers) reported that they had increased their involvement and confidence in managing their health. This work is ongoing, and we will continue our collaborative approach with patients, families, and providers in order to design clinical systems and tools to help coordinate the transition of care from the Children’s Specialty Center to adult specialty care. This work was created in partnership with the Children's Specialty Center at the UVM Children's Hospital and the Vermont Child Health Improvement Program at UVM's Larner College of Medicine.